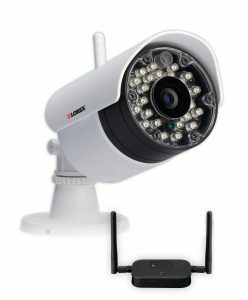 If you want a true wire free CCTV camera, meet the Lorex LW2231. Yes, that’s right, not a single cable is needed to install these cameras. They have an effective night vision range of 135 ft, are weather and also vandal proof. They use a technology called Signal Guard which ensures the integrity of your system and minimizes interference across with the wireless transmission of your footage. The wireless range of the cameras is 165 ft from the receiver. So what’s the footage like? Well they shoot in SD and use MPEG-4 compression. They have a built in mic for audio recording, built in LED’s and the F2.0 lens has a 55 degree viewing angle. They also have wide angle 3.6mm lenses and capture video at 30 frames per sec. You will need to order a dvr separately if you want to record your footage. One of the main benefits of this system is that it is completely cable free. An intruder will not be then capable of disabling your camera feed if you are running cables externally.